The Washington Free Beacon’s ongoing vetting of potential presidential candidate Hillary Clinton is obviously stressing the former Secretary of State’s Palace Guards in the mainstream media and Hollywood. As we reported last week, The Beacon’s recent unearthing of correspondence between a 23-year-old Clinton and Leftwing radical Saul Alinsky resulted in a massive pushback from some of Politico’s top staffers. 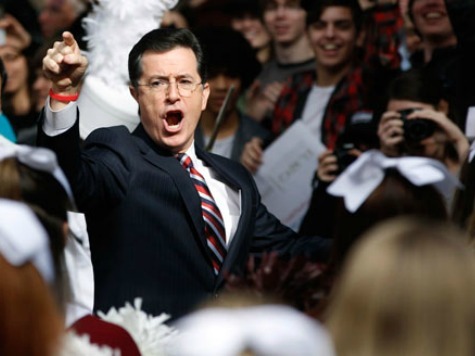 Tuesday, using the same tactics as the Politico staffers (and a joke stolen without attribution from a Media Matters staffer), The Colbert Report’s Stephen Colbert ran to Hillary’s defense by mocking, dismissing, and nothing-to-see-hereing the vetting of an individual seeking the most powerful office in the world. For context, here’s Colbert attacking then-presidential candidate Rick Perry over a 30-year-old rock found at a hunting camp he didn’t own. Yes, yes, Colbert’s just a comedian, which is why the mainstream media broadcasts his clips more than Comedy Central does. If Hillary’s Palace Guards want to make a case for why her political ideas and morals have changed since her infatuation with a lying, anti-freedom socialist like Saul Alinsky, I’m all ears. But to mock those digging into the adult past of anyone seeking the presidency is un-American. To dismiss and downplay the material discovered is outright dangerous. Our media and entertainment Overlords did this with another Alinsky disciple, Barack Obama. Look what that brought us.